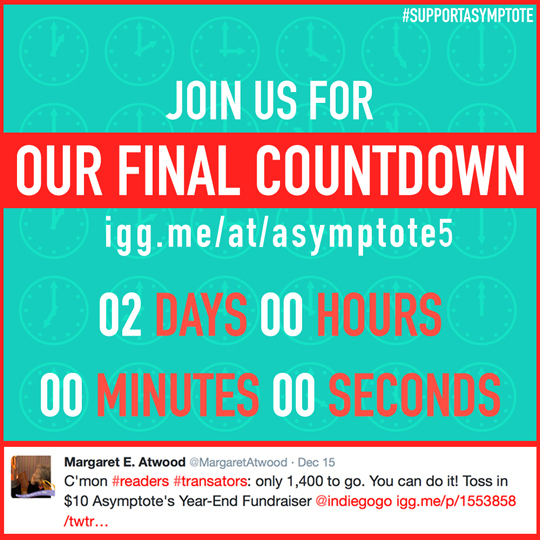 Margaret Atwood Wants You to Support Our Year-End Fundraiser! Only three days and exactly $1,220 left to go! Donate to our fundraiser today. This year was a big one for us at Asymptote! We won the 2015 London Book Fair Award for International Literary Translation Initiative and became the only member of The Guardian‘s Books Network dedicated to world literature. For the second year running, we made it to Entropy’s Best Magazines of the Year list, for doing “particularly exciting & generous things.” This was also the year we were mentioned in The New York Times, interviewed by Lianhe Zaobao, and praised in Der Tagesspeigel. With your support, we were able to continue publishing our quarterly issues, as well as a monthly podcast, a daily blog, and our brand-new fortnightly airmails (with Daniel Hahn’s very popular column, “Ask a Translator”). Apart from releasing our first-ever educator’s guide, enabling teachers everywhere to use us as a classroom resource, we also kept our promise and organized a second edition of our international translation contest (still ongoing!). Judges Michael Hofmann, Ottilie Mulzet and Margaret Jull Costa will help us award $4,500 to six emerging translators. Now, we’re raising funds to hold our most ambitious series of anniversary events around the world yet. From January 2016 to April 2016, we are planning as many as 15 anniversary events around the globe, spread out over 5 continents. Confirmed participants include Ann Goldstein (translator of Ferrante), Forrest Gander (translator of Neruda), Natasha Wimmer (translator of Bolaño) and cult author Frederic Tuten in New York (Thursday, Mar 3, 2016), as well as acclaimed poet Caroline Bergvall in London (Wednesday, Mar 23, 2016). 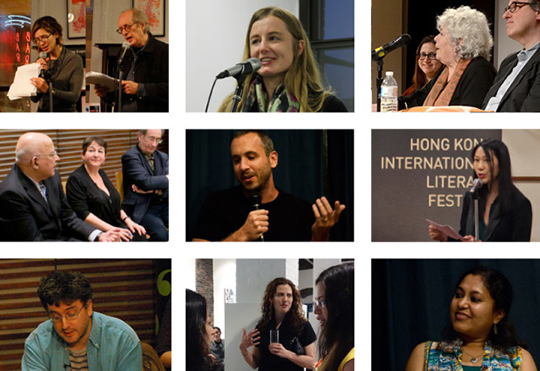 With our extensive experience (all previous 26 events documented here) we’re looking to curate a series of thoughtful readings and panel discussions in the name of promoting literary translation and world literature. All the money that we raise will go into organizing and publicizing these events, as well as marketing our fifth anniversary issue, so that even more readers can take advantage of our ever-expanding archive of world lit. Junot Díaz, Yann Martel, Ingo Schulze and Sybille Lacan (daughter of the famous semiotician) have all contributed new and exclusive material to this milestone issue. And, for the first time in our pages, we will feature work from Uzbek, Mongolian, Guyanese and Sumerian, bringing our language tally up to 101—truly an achievement worth celebrating! Reserve your tickets to our anniversary events with a donation now, if you’ve enjoyed what we’ve brought you this year. Support us so that we can bring our global conversation to a new city and give our fifth anniversary issue wings to reach more readers. Furthermore the psychological boost that your donation represents (we’re all volunteers, remember) will help us carry on = PRICELESS.